Sichuan native Geng Yuying has been a botanist for over 30 years at the Chinese Academy of Sciences and is the author of The Genus Rhododendron of China. 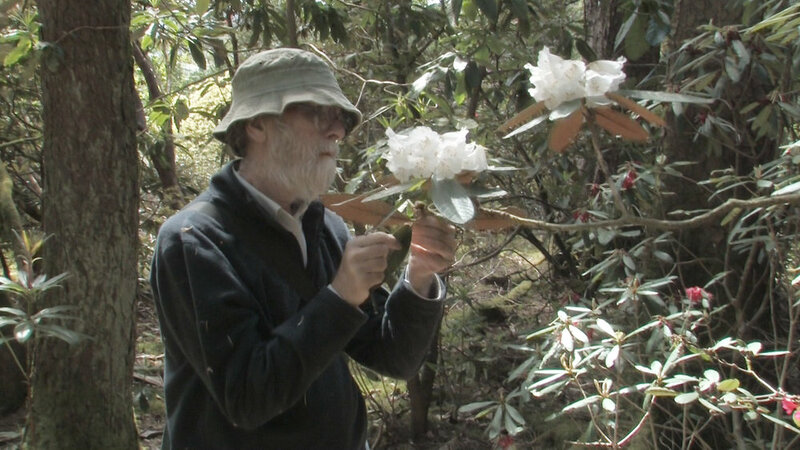 Formerly a researcher at the Royal Botanic Garden Edinburgh, David Chamberlain is co-author of the IUCN's Red List of Rhododendrons. Fang Zhendong is the director of the Shangri-la Alpine Botanic Garden, located in Shangri-la, Yunnan province. Sun Weibang is a senior researcher at the Chinese Academy of Science Kunming Institute of Botany, Yunnan. Co-founder of the Rhododendron Species Conservation Group, Ian Sinclair is a horticulturist who has worked for many years to protect rhododendrons in Scotland. Hou Shen is a professor in the Center for Ecological History at Renmin University, Beijing, and author of The City Natural. Liu Huajie wrote the book Bowu Rensheng (Living as a Naturalist) and teaches philosophy at Peking University in Beijing. Pan Fujun, a professor at Chinese Culture University in Taiwan, studies plants in China’s literature. He has written a series of books including Plants in the Book of Songs. Lai Yu-chih is an art historian and researcher working at the Institute of Modern History, Academia Sinica, Taiwan. Wen is Executive Director of BGCI (Botanic Gardens Conservation International) China office based in Guangzhou. Hu Jer-ming is a professor in the Institute of Ecology and Evolutionary Biology at the National Taiwan University. Zhang Chao is the associate director of the Huaxi Subalpine Botanic Garden, Sichuan Province.